This page is for quilt blocks that are larger than 16" as a finished product. Some quilt block patterns lend themselves better to be larger -- generally, because they are made with measurements that are not the norm, or they are more complicated and therefore require more pieces. The good news here is that by making a larger quilt block, you need to make fewer for your final project. A win-win situation. The Ribbon Squares quilt block gives you an "extra bang for your buck", in that it is two blocks in one. The centre of the block is comprised of a Sawtooth Star and that is expanded to include the extras. All in all this makes up this new block called Ribbon Squares. The resultant quilt block is therefore larger than many blocks, so this is a good choice if you want to create a quilt faster by having to construct fewer blocks. 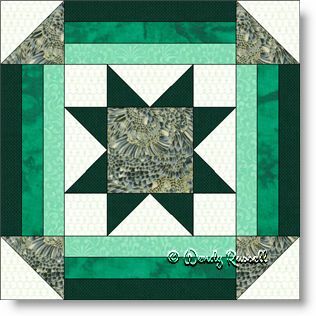 The sewing of this block is simple using only only two pieced patches -- half square triangles for the four corners, and flying geese units as part of the centre of the block. The two sample quilts illustrated are both designed with the blocks on point but are very different. There is no end to the layouts you can come up with for your own quilt design. Have fun!